MINIMAL worked closely with the Industrial Design team at FUJIFILM SonoSite, Inc. in the creation of their next generation ultrasound platform. 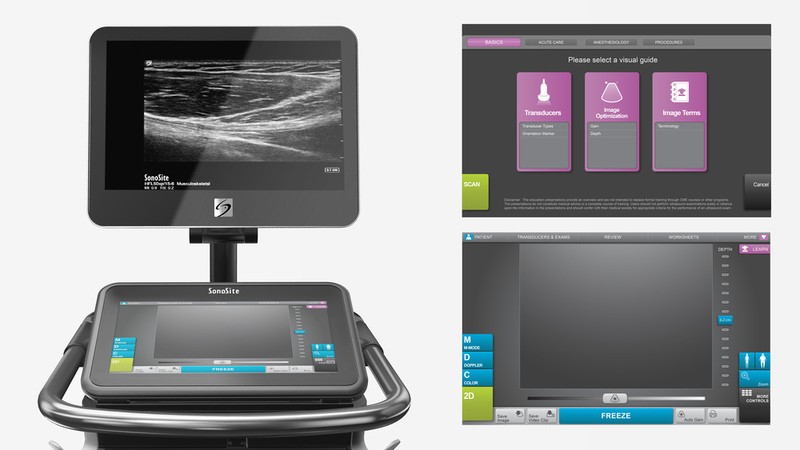 The result is the SonoSite X-Porte™ Ultrasound Kiosk, the first ever point-of-care ultrasound system to integrate advanced signal processing for high resolution imaging, 3D animated clinical guides, and a cutting-edge, multi-gestural user interface. Through immense in-field research, interaction, and design studies, the team set out to further understand and improve doctor and technician user interaction within ultrasound equipment. By examining various users who rely on the power of ultrasound to perform in their life saving jobs, the X-Porte was developed to give users the ability to adjust the machine to a variety of scenarios. As environments change, so does the X-Porte, which was designed to have a slender footprint thus making it easier to navigate in hallways and bedsides at the most critical times. Combining this research and engineering prototyping, along with MINIMAL’s in-depth knowledge working with partners across the mobile hardware and UI space, helped create a game-changing product that sought to bring a new direct manipulation interaction to ultrasound visualization. The cockpit-like screen interaction was ergonomically designed to give users optimal one-handed control access while using transducers on patients. Introducing the touchscreen also helped eliminate unnecessary part lines on the hardware for optimal cleaning and infection control. The X-Porte kiosk is an important milestone in SonoSite’s ongoing effort to improve access to point-of-care ultrasound visualization. The kiosk was created to serve a broad spectrum of users, from novice to advanced, and represents an entirely new design and use paradigm for ultrasound.